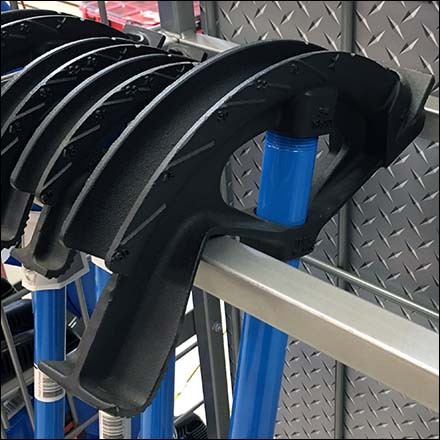 Two diametrically opposed solutions are merchandised from a single mobile rack in this Ideal-branded Conduit Bender and Fish Tape Display Rack. Conduit and Conduit Bender is the top-of-the-line solution for running cable, ethernet, and more. If you have no existing Conduit, runways, or chases built-in, then Fish Tape is your only resort. And is a professional, you really need both in your arsenal of tools. This Conduit Bender and Fish Tape Display Rack seen at Friedman Electric.